Using standard specifications and the remaining prototypes, we created detailed and accurate versions of the Denver and Rio Grande Western Railroad’s UTLX and CYCX Narrow Frame Tank Cars. Our UTLX Narrow Frame Tank Cars feature yellow lettering and some of the road numbers are equipped with tank side ladders. 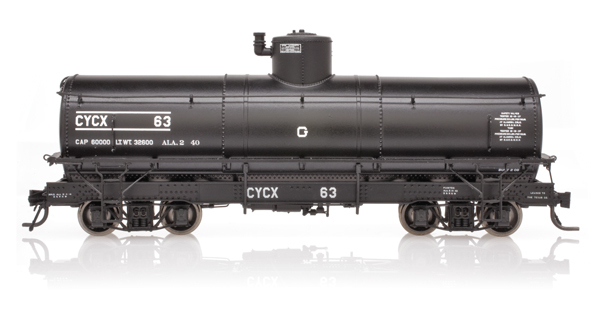 In stark contrast to the UTLX cars, the CYCX Narrow Frame Tank Cars feature white “gothic” style reporting marks and utilize a simpler approach to the data painted on the tank ends. None of the CYCX cars are equipped with tank side ladders. Because they were few in number, CYCX cars are a special addition to any modeler’s HOn3 collection. Note: Road numbers shown with a * come equipped with tank side ladders.